Best Payroll and HRMS Human Resource Management System in Karachi, Lahore, Islamabad across the Pakistan. Ahmad Brothers is a specialised Payroll and HRMS Solution provider in all major cities of Pakistan. Our Solution is Industry Based Solution for Small to Large organization in all sector. Web Based Online Time & Attencance Payroll Management System Our designed solution provide high tech support to manage your entire Payroll and HRMS function easily and smoothly. Provide easily integration with any time recording machine and generate payroll depends on machine attendance. We offer a most modern and powerfull management toll to manage your Personnel and HRMS department easily and confidently. Our user friendly interface provide comfort and confidence, so user can perform their task effeciently. Mangers can eaisly design, planning, execution, control and monitoring of entire Payroll and HRMS functionality. Provide tight integration with other modules to share valuable information, including forecasts, salary history, expenses, PF and loan etc. Hiring the right person for right job is most important and of course critical task. In the simple word we can say that it’s an art. 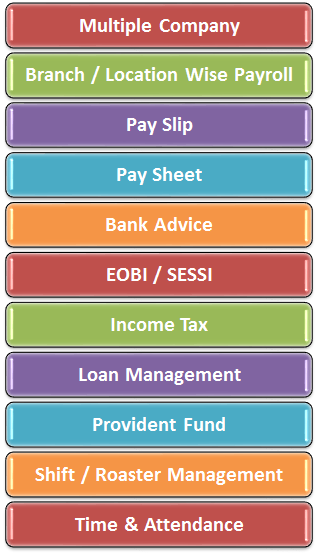 Our Payroll Management Software make it simple and easy. There are few types of hiring in an organization, most of them very important and technical. If we hire a person after so many efforts, after few days we realize that the person is not performing good and quality work or not illegible for his job. It is a disaster for employee and employer booth. To avoid these types of situation we need to know:Where is the problem? Why we could not hire right person? The major question is that have we needed a person? Are we capable to evaluate a person as per his qualification, skills and experience? Instead hiring a person from outside, why don’t we see in our organization for Mr. Perfect. As per my opinion existing staff knows our company better and familiar with us and other staff, so there is minor chance of any failure. Secondly it is motivation for our existing staff to promote them. Result, healthy working environment, motivated staff and quality work. Basically we know and familiar with each other and we know about capability of our staff. Remember CV and some meeting is not sufficient to know in better way. Payroll Management | Human Resource Management | Time & Attendance Management Attendance is the very important and necessary element of payroll. It’s first step while preparing payroll. We can say that attendance is very difficult and time consuming part of payroll, if you don’t have any automation like time and attendance system. It is a dream of the employers and payroll managers to have automation regarding time and attendance. Account Plus Business Suite enables them to manage time and attendance with fully automation without any problem and hurdles. Manual management of payroll is pain and creates lot of problem, you need extra time to prepare payroll manually. Compilation of attendance and leave management is very sensitive and time consuming job. Our Payroll Management Software smartly manages attendance with the help of any attendance machine. It capable to integrate tightly with any machine and provide fully automated attendance solution. No problem if there is any problem in your machine, you can manage your attendance manually till problem resolved. Account Plus - Human Resource Management System enable us to find out the right person from our company. Basically we maintain complete employee information, complete bio data or brief CV including education history from beginning to ongoing, Job History, Skills and ongoing Training Company provided or self-sponsored. Provide complete job tracking record, transfer and promotion history. And I think existing of this kind information it so simple or easy to select right candidate for right job. I know another important question in your mind. What will be happen if we don’t found any employee in our company as per our requirement? Account Plus provides another tool (Employee Data Bank). It helps you to register and maintain employee data bank (CV). What you need to do! Register all in coming CVs in our database instead of filing which you receive through emails or physically. After few days you have a huge databank with different candidates. So you can easily search them as and when require. Just execute Account Plus and go to the HRMS section; here you find a search tool, which will search entire employee data bank as per your requirement. You can search through education, experience, skills, training, gender, age etc. Our HRMS Human Resource Management System is state of art system, which helps you to manage your HR (Personnel) department according to most modern methodology and best practices. Provide complete and best solution from hiring to firing. Employee benefits, and payroll calculation is necessary for every employer. Benefits and salary workers keep their employees working for them and made less Systems Management staff, chasing the most important asset. Concerns are important tasks can; he can cause overwhelming for employees and relate to errors in the calculation and distribution of a number of significant advantages. Well organized and pay attention to the finer details is the key to your success. A properly designed employee benefits program and establishment plan benefits both the company and its employees in the long run. advantage employer Job satisfaction. Employees should work with their work satisfied and ready when they rewarded for their efforts. • Motivation. No doubt, carry out the promotion of workers' money and pay for performance programs are a win-win for both parties. As an employer, customer satisfaction should be your motivation, and thus customer satisfaction should be incentive for the employees connected. • Less absenteeism. Since the employees enjoy their work and feel that their pay is fair compared to industry standards, they would like to "punch in". Lower income. Employees do not get work elsewhere if they are satisfied with the compensation and benefits with their current employer. A system management staff also held respect for the workers. Provide opportunities for staff development will also contribute to lower sales levels. Employee Benefits • Peace and quiet. An attractive benefits package, employees in certain aspects such as health insurance excluded. Overcoming anxiety support families a stable work environment and staff more effectively. • Increase confidence. As a reward for achieving their work on a model for action, salaried employees are more confident in themselves and their abilities, which lasted only increases performance level. Long-Term financial stability. In an environment of economic uncertainty, the statistics show that a retirement savings plan through work is, usually, employed to the company they work or to calm the commitment to a prosperous future. These minimize the risk to find the employee alternative employment opportunities. Time to learn two more factors. Employee Benefits Benefits play an important role, not only for employees but also for their families. This commitment to family influence other decision makers in the family and a positive impact on the long-term financing for a business. Most employees have come to expect certain services and will find more versatile services of the company. Sort an array of flexible benefits staff tuition assistance through various types of health insurance is recommended. A company can not benefits workers appeal have problems when it comes to attracting and keeping good employees. Packaging of human creative services that attract the right kind of employees involved is an art in itself. Naturally mind control costs for the company, but there must be a balance when trying to bridge the gap between cost and staff expectations for the meeting. To set up social programs must, the employer should have a good understanding of the benefits package competition for human resources. They will help them make the best choice will be added to the media and the budget possible society. wage Labor Salary is a likely cost and success or failure of a business in the P & L monthly bill. And with the state of the world economy these days, has reasonable salaries never been so important. Employers must ensure that the management team payrolls fell in a very responsible people who have a stake in the success of the company. To properly manage employee salaries, the following components are essential: • Good employee time tracking system. Web-based platform for tracking hours of work, rest, eat lunch, and performance for a change is an important part of treatment for fast food on the weekends. Appropriate occupational classification. Employers need to be educated and have described the job descriptions for each position and level within the organization. This allows a standardized payroll and accounting accurately compensate employees. It also gives the employees an understanding of what is expected of him or her during the work. Maintaining low dropout. Promote safe workplaces and implement effective employee incentive program helps to reward employees with higher performance and to help others who want a higher level of security and performance. Workers compensation policy evaluation of the audit process. Encryption and proper accountability are the keys to a minimum underpayment, overpayment errors and other deductions. Employers should be warned about the importance of quarterly reports control and know that a small business tax laws that apply to a particular business. CPA and payroll professionals skilled precious to the organization, who is accused of avoiding the risks and liabilities of the company. To optimize a significant problem in the management of employee benefits and wages, as it takes time and effort to the daily work effectively carry out in a personnel management system reasonable. We encourage all business owners have a team to seek help outside interests, plan and implement an effective system for payroll processing organizations reduce costs and do not miss this important detail.